Actor Ryan Reynolds stars in gambling flick Mississippi Grind which hit theaters this month. To promote the movie, Reynolds appeared on The Tonight Show Starring Jimmy Fallon last week and the two played some blackjack where the winner got to hit the loser in the face with a giant prosthetic hand. They called it “slapjack.” It’s not the first time Fallon has played it on his show with a guest. The game made a lot of sense given the subject of Reynolds’ newest movie. Despite the segment obviously being a joke, Reynolds did indicate that he doesn’t know the rules of blackjack. Mississippi Grind is about Reynolds’ character and a chacter played by actor Ben Mendelsohn traveling around the U.S. south in search of action. 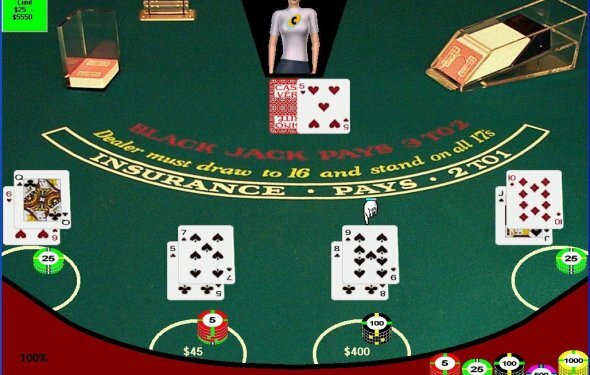 The duo gamble on a variety of games, including blackjack. “I need to go reshoot some scenes from Mississippi Grind, ” Reynolds said after Fallon laughed at him for not knowing how to deal out a hand of blackjack. Reynolds perhaps could take lessons from actor Ben Affleck, who actually was asked to leave a Las Vegas casino last year for card counting. Mississippi Grind appeared at the Sundance Film Festival in January. The film is 108 minutes and is R-rated. It comes from director-writers Anna Boden and Ryan Fleck.